Beats by Dre and Apple have redefined the way we listen to music with the revolutionary new pair of headphones, the Powerbeats 2 Wireless and its equally worthy successor, Powerbeats 3. Wired headphones are the things of the past now, especially with their wireless counterparts becoming the next big thing in the industry. Wired technology has dominated the headphones and earphones market for most of the 90’s era, but has been losing its grip since the adoption of the wireless technology. Growing market of multimedia devices such as smartphones and music players has fueled the need for more innovative technology and improvisation in sound quality. This is where the wireless technology bid goodbye to the conventional wired headphones. Beats by Dre has established quite a name for itself over the course of years to become a $1 billion-plus business with its unique range of headphones. There’s no denying the Beats success and how the legendary hip-hop artist redefined the whole headphone landscape. The idea is to bring something different yet equally trendy, something that would revolutionize the way music geeks listen to music. The most popular offering by Beats by Dre is the Powerbeats 2 Wireless In-Ear Headphones. Inspired by the legendary basketball player LeBron James, Powerbeats 2 is one of the best wireless sports earphones out there. Unparalleled sound quality and a comfortable, secure in-ear fit make the Powerbeats 2 an appealing choice for fitness enthusiasts and music geeks alike. This is the Bluetooth version of it already popular wired Powerbeats which has been dominating the market scene for quite a while. They are insanely light yet boast an iconic design to keep up the modern day trends plus the in-ear fit makes it your perfect workout accomplice. The earphone sits tightly in your ears, creating an acoustic seal that would propel the fitness freaks through their most rigorous workout sessions without worrying about the background noise interrupting your session. A few pairs of silicon ear tips are also included in the box for every fit and size plus the silicon hooks make sure they fit pretty snuggly. They are also sweat and water resistance so that you can comfortably wear them in the rain. Powerbeats 3 Wireless is the latest offering of the Apple-owned Beats by Dre brand and a worthy successor to the Powerbeats 2. They are the typical Bluetooth earphones that run off of a rechargeable battery that gives you a whopping 12 hours of uninterrupted playtime. It looks almost identical to the older generation wired headphones with silicon hooks that go behind the ears and a cord connecting the two buds. They sit tightly in your ears through vigorous workout sessions plus they also come with varied-sized ear tips to get the right fit. It gets you an hour of playtime with only five minutes of charging so that you could go an extra mile. It comes equipped with the class 1 Bluetooth technology accompanied by the Apple’s new wireless communication W1 chip which makes switching to Apple devices a breeze all the while providing an amazing battery life and 5-minute Fast Fuel charging. They are also sweat and water resistant to take you through tough workout sessions. The dual-driver acoustics deliver astonishing sound with dynamic highs and powerful lows to provide an unparalleled music experience. Plus it’s fully compatible with Siri, thanks to the completely redesigned RemoteTalk feature which remains one of the best on-cable functionalities used on a pair of wireless sports earphones. It also makes pairing with other Apple devices an easy affair be it your iPhone 7 or the Apple Watch for that matter. 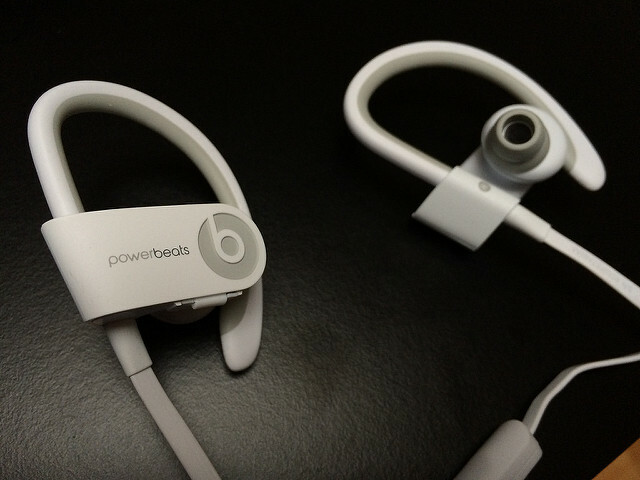 Both the Powerbeats are virtually identical with a little or design changes whatsoever. Everything is just the same – multiple ear tips, silicon hooks, and same over-the-ear fit – except the Powerbeats 3 comes with an improved ergonomic design. Both fit in snuggly around the ear for a comfortable, secure fit. Both are pretty great headphones for fitness enthusiasts and music geeks alike. Both have the same over-the-ear fit for better comfort and wearability, plus the same hook design which allows you to keep the earphones for long hours without falling off every few minutes. Powerbeats 3, however, comes with a toggle that tightens on the cord to make them fit snugly around the back of your head. Both share the same features except the Powerbeats 3 comes equipped with Apple’s proprietary W1 chip for better wireless connectivity so that you could connect with multiple Apple devices like the Apple Watch, iPhone 7 and more. It features the latest in Apple Bluetooth technology for seamless connectivity. The W1 chip extends the battery life of Powerbeats 3 by almost 6 hours and the quick charge time by 30 percent. As a result the Powerbeats 3 can offer 12 hours of uninterrupted playtime on a single charge, plus it gives an hour of play after only 5 minutes of charging. Beats by Dre is one of the biggest players in the premium headphone segment that has been dominating the music scene based on sound quality alone. Powerbeats 2 and 3 are two of the most popular wireless sports earphones by the Apple owned Beats by Dre. Both the Powerbeats are perfect earphones for fitness freaks who would love to make the most out of their workout sessions, plus they are equally favored by the music lovers alike. Both are almost identical in terms of design except with a few minor changes. The main difference between the two is that the Powerbeats 3 is equipped with Apple’s proprietary W1 chip for seamless connectivity and increased battery life by up to 6 hours. Sagar Khillar. 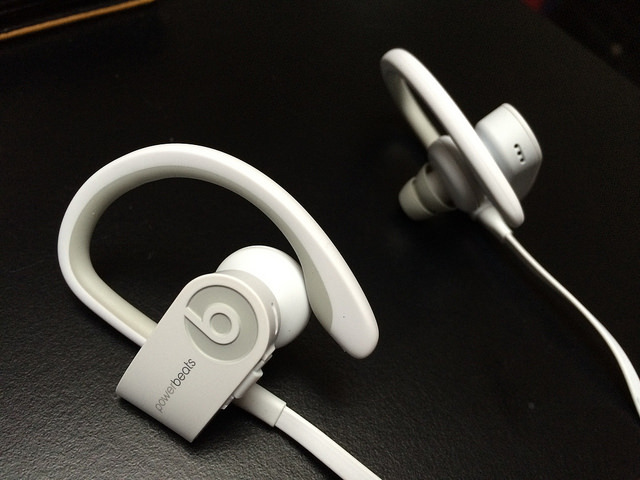 "Difference Between Powerbeats 2 and Powerbeats 3." DifferenceBetween.net. 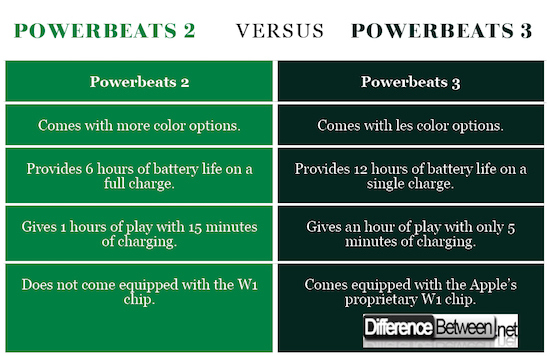 April 2, 2019 < http://www.differencebetween.net/object/gadgets-object/difference-between-powerbeats-2-and-powerbeats-3/ >.